Come discuss the feature here. We’ve just pushed some rather major changes to how LibraryThing displays authors, as well as other contributors to a work, like translators, editors, etc. This functionality has been around for a few months for members of the Board for Extreme Thing Advances, but we’ve improved it and released it. We thank them very much for helping us get it right! LibraryThing has long allowed you to edit and add multiple authors and their “roles” within their catalogs, the so-called “book level.” Now, work pages also include an “Other authors” module with a link to “Add/edit other authors.” Clicking that link will open up a lightbox where you can add, edit, confirm or reject other author entries for that work, assign the various authors to the correct roles, and mark whether they apply to the entire work or to only some editions. By popular request we have also opened up the “primary author” to editing, so you can now edit them, and their roles. Other authors who apply to all editions of the work will show up at the top of the work page, like A Passion for Books, where Ray Bradbury wrote the foreword. Authors who contributed to some editions will show up in the “Other authors” section, linked from the top of the page: an example is Keigo Higashino’s The Devotion of Suspect X, showing Alexander O. Smith as the translator. There will, of course, be debate on the issue of main and secondary authors. Generally speaking, co-author or co-editor status falls under the “main author” setting, while most other roles would count as “secondary author.” Obviously there will be exceptions to this, such as a book of photography or artwork where the artist rises to the level of “main author”. This concept of “other authors” is live across the site, but it will take a while to play out how it should appear everywhere. But we wanted to get it out there and let you all have a go. Come talk about the feature here, or report bugs here. 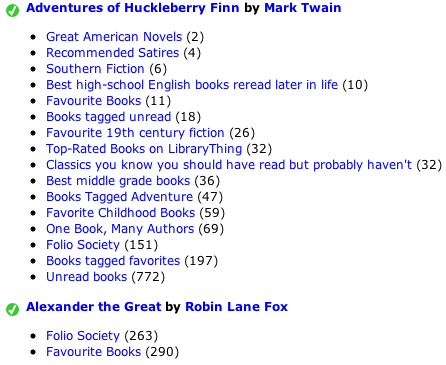 The changes prompted but do not require a change to how book/work pages show their book- and work-level data. This question is being discussed here. 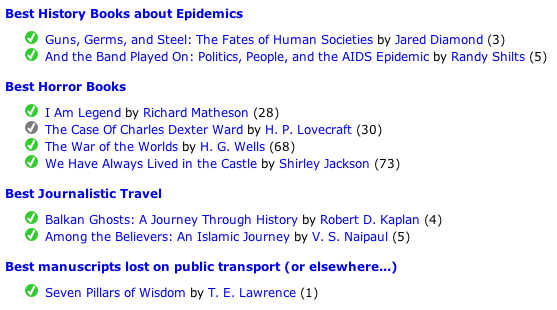 We’ve just added a new Zeitgeist page for popularity, allowing you to track a book’s popularity over time (month, quarter, year) based on the number of times the book was added to members’ libraries over that time period. Check it out. Arrows indicate changes in popularity over time; the number next to the arrow tells you how many ranks the book changed from the previous month/quarter/year. 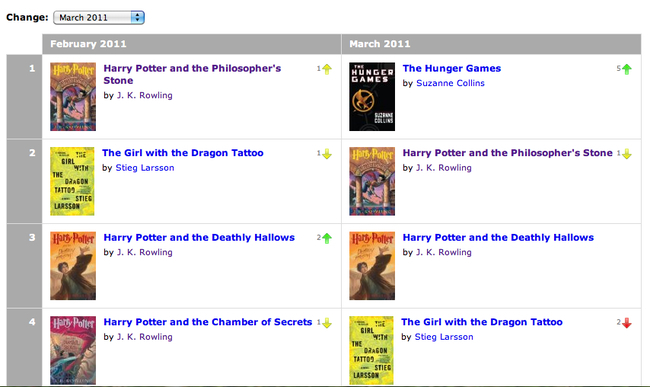 For clarity, we’ve changed the home-page feature “Popular this month” to “Hot this month.” The difference is easier seen than explained, but basically “Popular this month” includes the always-popular stuff (eg., Harry Potter) and “Hot this month” includes the newly popular stuff, by comparing titles added this month to all the titles added to LibraryThing in past years. We’ll be adding a viewer for these to the Zeitgeist page soon. LibraryThing had a “friend finder” back before they were ubiquitous. But we’ve lacked one for a while. So we’ve just released a handy new Friend Finder for LibraryThing. Friend Finder allows members to connect easily with their Facebook and Twitter contacts who also use LibraryThing, or invite their friends to join the site. New members will see this as an (optional) step as they create an account, while current members can access the Friend Finder on the Edit profile and settings. For people already on the site, Friend Finder gives you a one-step way to add them to your friends, interesting libraries, contacts and so forth. These work just like adding them from their profile page. For invites, we take a typically respectful approach: no invitations will be sent without your explicit consent and you have to send them one at a time—no spamming everyone you know. You can change the wording of the invitation before you send it. Twitter messages are posted @ your friend. Facebook messages are posted to your friend’s wall. Feature: Where did you get your books? We’ve just added MetaMetrics’ The Lexile Framework® for Reading, commonly known as “Lexile measures,” to LibraryThing. These offer another way for members to view their books—this time by reading level. The feature. You can look at pages for any Lexile, or for a range of Lexile measures. You can, if you’d like, add the Lexile® measures column in Your books for easy viewing or sorting. The Lexile measures in your catalog are based on more than 115,000 ISBNs to which Lexile measures have been assigned by MetaMetrics. Background. Since LibraryThing was created we’ve drawn interest from teachers and school librarians. Our ease of use and advanced features have led a number of small schools to use us as their primary catalog, along with numerous classroom libraries and other collections. Many have, however, asked us to add something provided by other school-library systems, like Follett and Alexandria, namely Lexile® measures. Lexile measures are based on the comprehensibility of the text—the lower the Lexile measure, the easier the book’s text is to comprehend. The official Lexile scale ranges from 200L to 1700L (see the Lexile map [PDF] for example texts), though actual Lexile measurements in LibraryThing range from 0L to 2000L. Check out Lexile.com for more on Lexile measures. If you don’t want it… We recognize that Lexile measures are neither comprehensive or universally appreciated. We want to make them available to people who will find them useful, but hope they’ll be unobtrusive to others. Come talk about it in the New Features group.